Созданный на базе самолета Type LA и сохранивший его расчалочное крыло-парасоль, прототип двухместного учебного самолета Morane-Saulnier Type AR совершил первый полет в начале 1915 года. Он получил новый киль, двухместную открытую кабину с тандемным расположением ДальшеMore>>> сидений, сдвоенное управление и обычное шасси. После войны началось крупносерийное производство самолета под обозначением MS.35 (категория E.P.2), и основным вариантом стал MS.35R с 80-сильным (60 кВт) ротативным ПД Le Rhone 9C. Также строились варианты MS.35A с двигателем Anzani и MS.35C с двигателем Clerget 9C мощностью 80 л. с. (60 кВт). Построили свыше 400 самолетов, большей частью служивших в пилотажных школах ВВС, откуда их списали в 1929 году. Часть машин попала в гражданские аэроклубы и к частным владельцам и продолжала летать на протяжении 1930-х годов. Самолеты также несли службу в ВМС Франции и ВВС ряда других государств, в том числе Польши (70), СССР (30), Аргентины, Бельгии, Бразилии, Гватемалы и Турции. Максимальная скорость MS.35R составляла 125 км/ч, а потолок - 4600 м. Размах крыла самолета - 10,57 м, а максимальная взлетная масса - 764 кг. 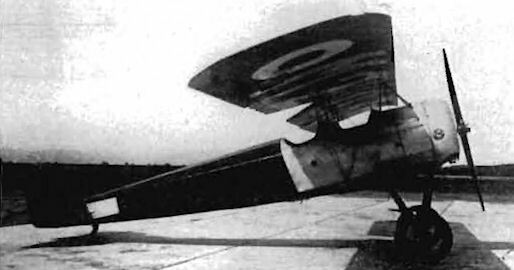 In a general way the three monoplanes exhibited were of very similar design, the only real differences being as regards the form of wing bracing and in the matter of seating arrangements. If, therefore, we take the type AR and describe it in detail, pointing out wherein the other machines differ, the general design and construction of all three machines will be understood. According to the makers, the Morane-Saulnier type AR has been designed for Tourisme. It is a two-seater, with two separate cockpits arranged in tandem, and the power plant is an 80 h.p. Le Rhone. Generally speaking, there is a good deal of similarity between this machine and the pre-War Moranes, of which several were flown at Hendon in 1914, a number of them being built under licence by the Grahame-White Co. There is this difference, however, that whereas the older machines were of the ordinary type, the new ones are all parasols. The wing bracing differs considerably from that of the earlier models. 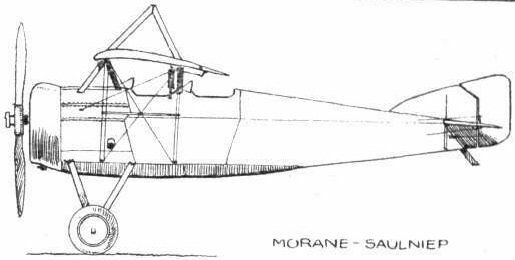 Instead of the two inverted Vees supporting the front spar and one inverted Vee under the rear spar, with a three-legged cabane above the wing for the anti-lift bracing, the modern Morane-Saulnier type AR has for the support of its front spars a four-legged pyramid of steel tubes, and for the rear spar a simple inverted Vee. The top cabane consists of a single inverted Vee of wood, placed on the centre line of the wing. The whole wing is, therefore, more or less hinged around a central longitudinal axis, and is held in position by the cable bracing only. Constructionally the wings are of standard type, with spars and ribs of wood. The ailerons - which have now supplanted the warping wings of the older models - are built of duralumin tube throughout. Each aileron is carried on three hinges, mounted on an auxiliary spar placed some little distance behind the rear main spar. The aileron carries a crank, linked to another crank on the main control tube by a short horizontal tube. The main control tube runs along the rear spar, and terminates at its inner end in a crank from which a tube runs down to the controls. The wing bracing is in the form of piano-wire, both above and below the wings. The fuselage construction is, in the main, similar to that of the older types, with the exception that in the modern machines the struts are placed with their ends on the longerons and not secured by bolts through strut and longeron, as were those of the pre-War machines. Also, instead of the horizontal knife-edge which characterised the old Moranes, the new machines have a vertical stern post, and are, in addition, provided with a fin. One, therefore, has much more faith in the directional stability of the modern version. The undercarriage remains much as of old, with only minor alterations to the apices of the Vees. The Morane-Saulnier type AS is similar to the AR, except that it is of slightly smaller dimensions, is a single-seater, and has its wings slightly swept back in order to enable the pilot to be seated behind the rear spar instead of under the wing, as is usually necessary with single-seater monoplanes having light rotary or radial engines. THIS veteran firm of aircraft builders, which originated the parasol monoplane type - a type that enjoys today great popularity among French constructors, as will be seen from the exhibits of the Salon - will exhibit three machines. 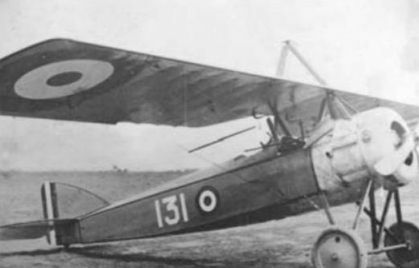 The first of these is the Morane-Saulnier type 35 E.P.2 elementary training aeroplane, with 80 h.p. Le Rhone engine (the letters E.P. stand for ecole primaire); the second is a type 129 E.T.2 (180 h.p. Hispano-Suiza) advanced training aeroplane (the letters E.T. meaning ecole de transition); the third machine is the type 132, with 120 h.p. Salmson aircooled engine, which is mainly intended for touring purposes, but may also be used for training work. 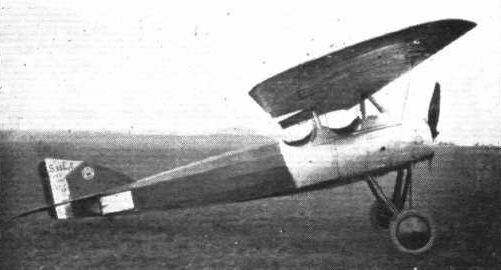 The 35 E.P.2 elementary training machine, of which large numbers exist in the French and foreign military air services, is too well known to require more than a brief mention. The framing of the wings is of timber, except for the spars, which are duralumin tubes. The fuselage has wooden longerons and plywood formers. 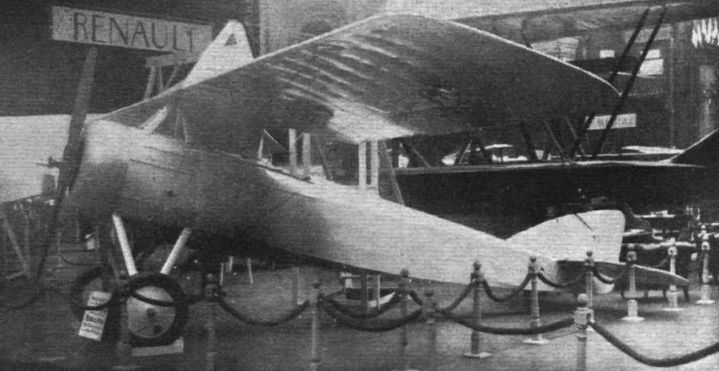 Both the wings and the fuselage are fabric-covered. The undercarriage struts are steel tubes. Special care has been taken to make the controls highly responsive and so enable the instructor to impart to his pupil good flying manners; with this end in view the pivoted portions of the controls are mounted on ball bearings, thus insuring great smoothness of action. The tail skid is steerable. The normal equipment includes a fire extinguisher and parachutes for the two occupants. Wing area 18 sq. 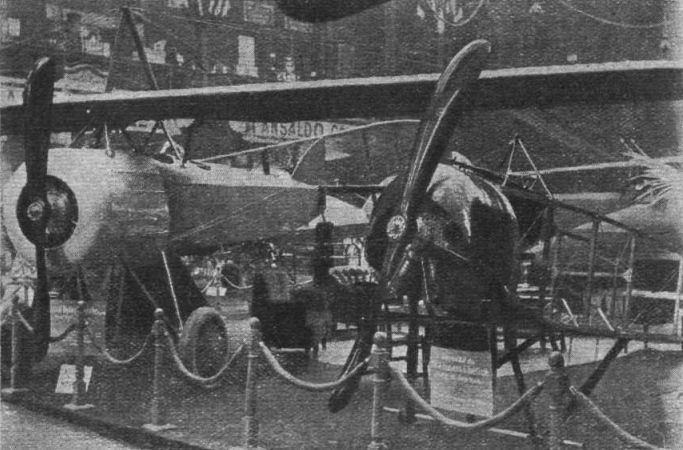 m.
THE three parasol monoplanes exhibited on this stand were all of the same general type, the main differences being in the power plants and, in the case of the 35 EP 2, wire bracing above and below the wing, as compared with the rigid strut bracing of the other two types. The machines are very popular in France for school work and touring, and this firm has had such lengthy experience of this class of work that it may be expected to know exactly what is required. THE MORANE-SAULNIER E.P.2, with 80 h.p. le Rhone, is an elementary training machine. Самолет, известный как Type AR или MS.35, демонстрирует основные черты, характерные для ранних разработок компании "Morane-Saulnier": ротативный двигатель, расчалочное крыло-парасоль и элегантное хвостовое оперение. На самолет поступали заказы из зарубежных стран. On the Morane-Saulnier Stand: On the left the M.S. two-seater, type AR. On the right the nose of a pre-War type Morane monoplane, fitted with interrupter gear. MORANE-SAULNIER: The parasol monoplane was fitted with a Leitner-Watts metal airscrew. Twenty-two of the 30 IAR-MS.35s built at Brasov, lined up in the front of the factory’s main hangar in 1928.